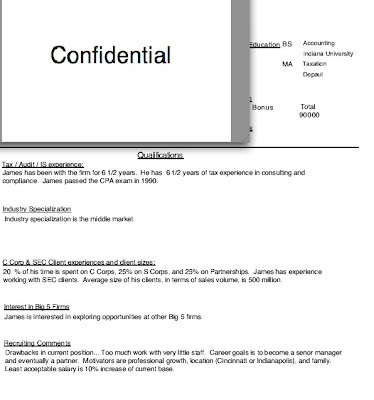 With most executive search assignments, our firm is working with several key decision makers of a corporate client. Usually, we have at least one Human Resources representative, a function or department hiring manager, and several superiors, peers, or staff level reports who have input into the hiring process. Working with boards and search committees to fill executive positions adds another dynamic to this decision making process. And, we successfully work with the corporate team, board or search committee, and the finalist candidates to achieve everyone's ultimate objective. You brought us quality candidates; facilitated the interview sessions; did not impose your thoughts on us; respected our time and attention to the subject; were professional in all matters dealing with us in the search process; provided advice when appropriate. 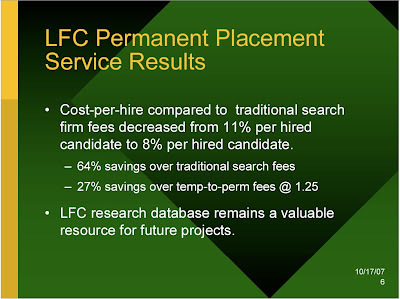 Your firm was a very valuable part of the search and selection process. 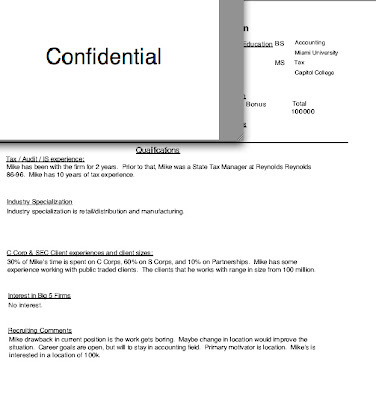 I originally thought our HR staff could do the search without any assistance from outside of the organization. I am satisfied that I was wrong and that we would have erred should we have attempted the search without professional help. 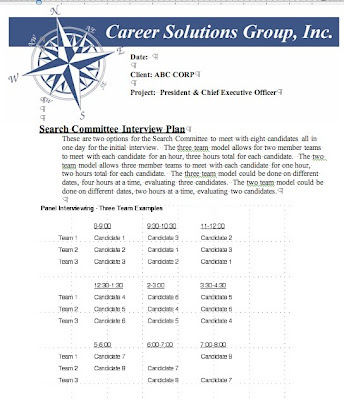 Success with an executive search process requires thorough planning, coordination and communication, and then execution. 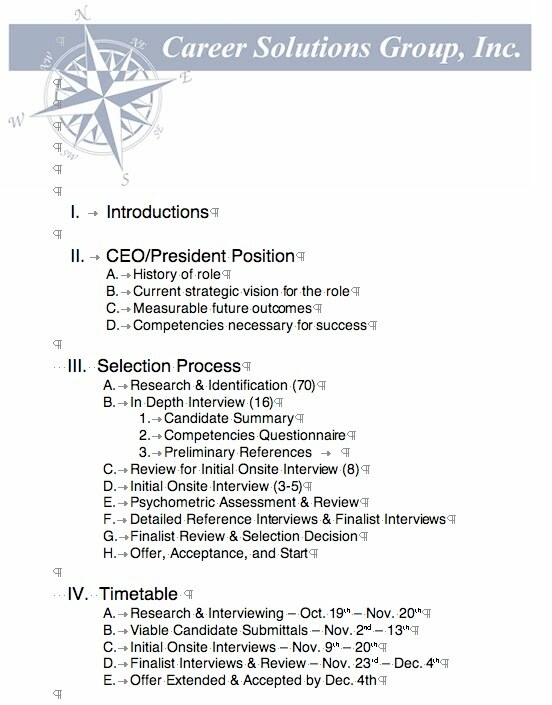 We start by meeting with the search committee and/or board to discuss the search and develop a process that meets everyone's objectives. If necessary, we will also meet with the senior management team for their input and involvement in the process. For board member coordination, we can coordinate flexible meeting schedules or teleconference discussions to meet everyone's availability. 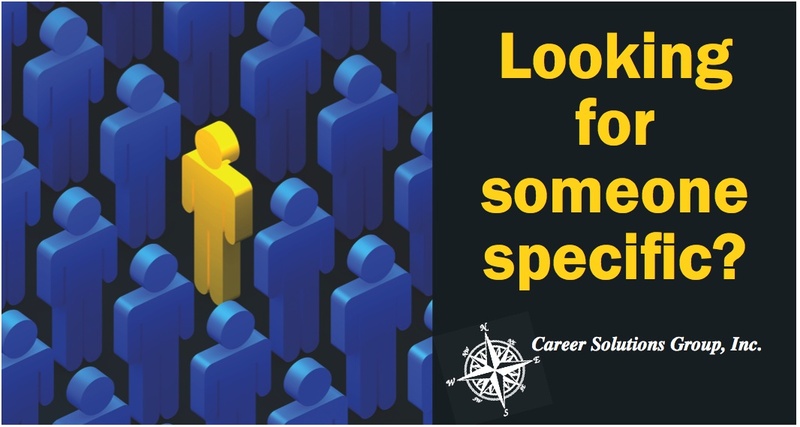 Career Solutions uses a multiple source methodology to acquire a comprehensive pool of potential candidates that are passive, active, and internal/referral. 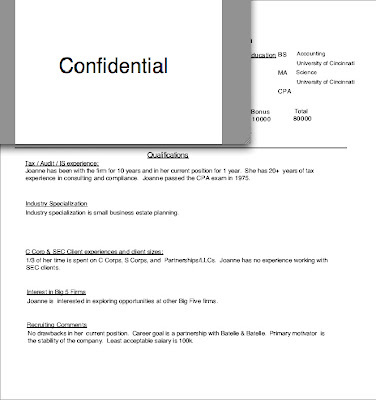 Our research objective is to identify the complete universe of potential candidates specific to an assignment. 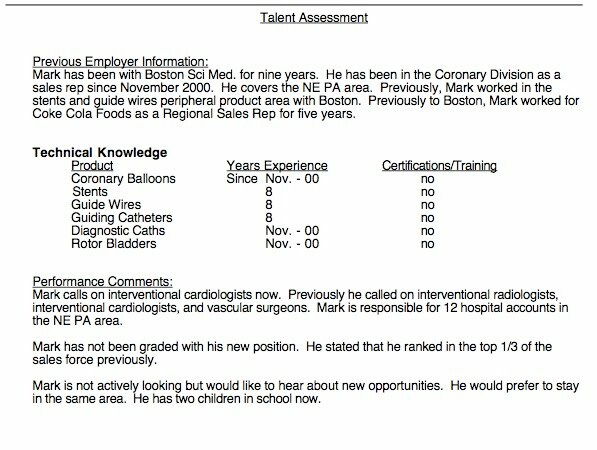 Our staff identifies and tracks potential candidates through the initial technical qualification. And, executive core competency assessment by our consultants, reviewed and validated in conjunction with search committee and board feedback. 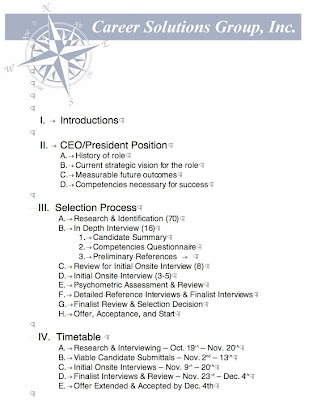 And finally, detailed interviews of key references, picked by our search committee and not the candidates, to validate the critical competencies, strengths, weaknesses, and managerial characteristics of each finalist candidate. While this process may appear time consuming, it far less time consuming than an executive search process that stalls with no clear decision or having to start the process over. 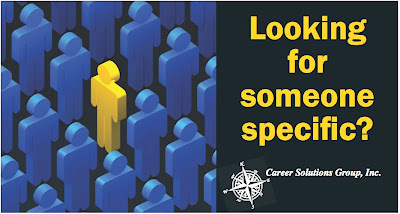 Career Solutions executive search process does provide your search committee or board with comprehensive evaluation to confidently reach a consensus decision for your new CEO or President. Thank you very much for all you have done in getting us this far through the maze which, of course, we all hope will lead to a new and effective CEO. You have done a super job and it is much appreciated. Once again, thank you for the work you did for us and for leading us through the process. If you have need for references in the future, please do not hesitate to call. This individual is responsible for managing assigned work out credits to ensure that the quality of loan administration processes is maintained and the documentation of loans meets established requirements and standards. The incumbent provides the highest quality of service to every customer. Develops plans of action with borrowers which present a program to ensure no loss to the Bank or to recover the maximum amount with minimum loss where possible. May also work with outside professionals to develop plans. •Makes presentations at various Loan Committee meetings regarding proposed plans of action and/or status reports on those plans. •Works with internal staff regarding action plans for problem loans remaining with line officers. •Ensures adherence to policies and procedures, maintaining accounting records, controlling collateral, and ensuring proper loan approval and retention of documents in an accurate and timely manner, in order to ensure that proper policies, procedures and documentation exist to support the lending process. •Ensures the process of accepting, safekeeping and releasing collateral which includes the recording of all recordable instruments, preparing reports, maintaining insurance, reporting and documenting HDMA and other files in an accurate and timely manner in order to ensure the control and maintenance of all notes, general ledger and other loan documentation. and interest adjustments. May also resolve problems in order to ensure the integrity of loan processing procedures while providing excellent customer service. Additional Responsibilities: Special projects as assigned by the Vice President, Loan Administration. 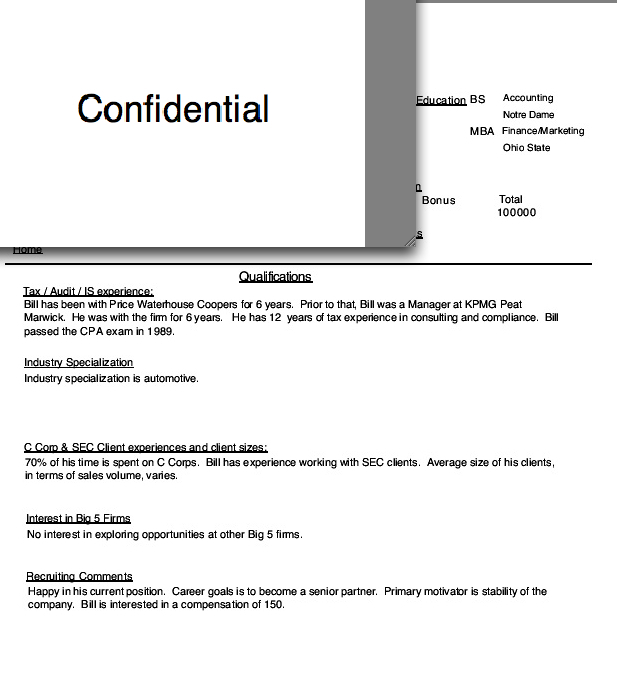 •Five-plus years of position-related experience which includes lending and/or credit analysis experience with a banking institution. •Ability to influence lenders to correct problems and deficiencies in a loan package. •Knowledge and understanding of compliance issues and regulations, as well as the Bank's lending policies and procedures. 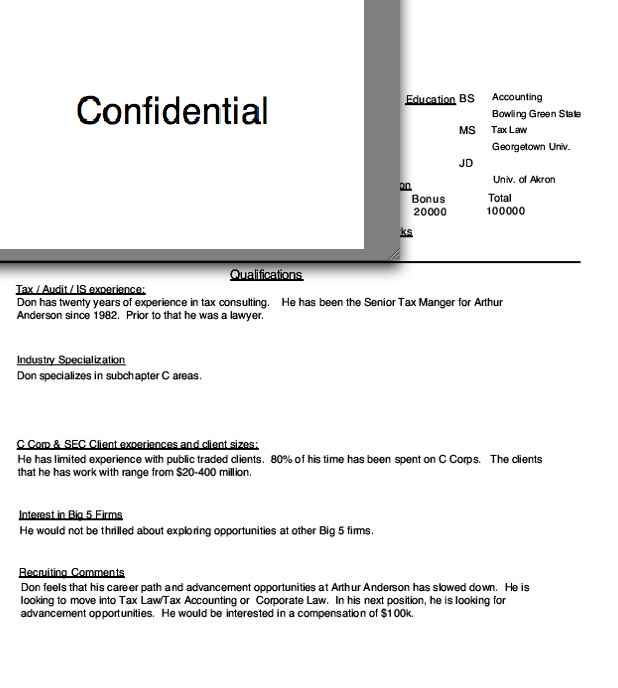 •Knowledge of the Bank's audit policies and procedures. •High degree of accuracy and attention to detail. 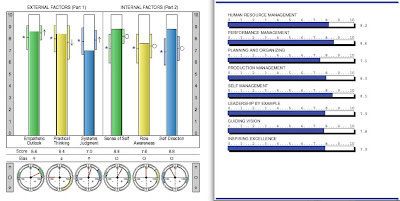 •Ability to organize and prioritize tasks. •Working knowledge of computer applications, plus proven experience effectively using a personal computer. 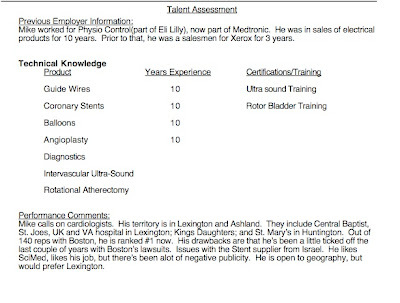 Physical requirements include the ability to use a keyboard and telephone. 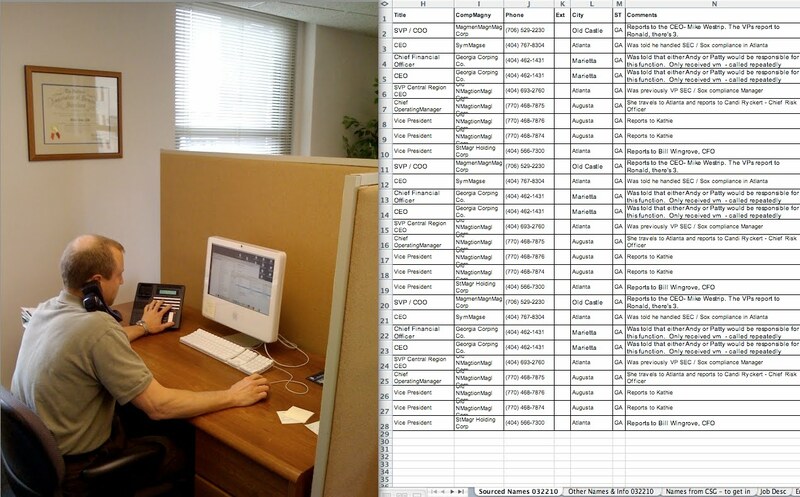 Ability to sit for up to four hours at a time performing desk and computer related duties. Must be able to travel independently throughout the office and extensively over the road to prospect and company locations. 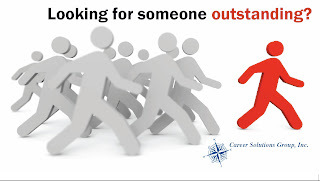 Because Human Resources is an organizational function comprised of eight or more disciplines, some of our most successful assignments have been outsourcing partnerships with a corporate Human Resources team that cannot spend the time and resources dedicated to talent research, recruiting, and selection that a specialist firm like Career Solutions Group, Inc. can. 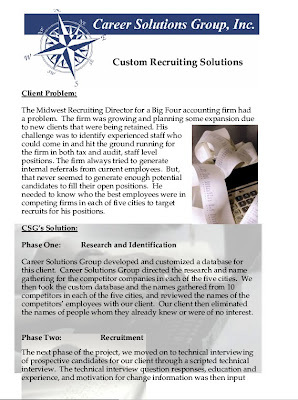 One of our most successful large projects was with a global public accounting firm that asked us to construct a database of their competitors' talent in the Midwest. 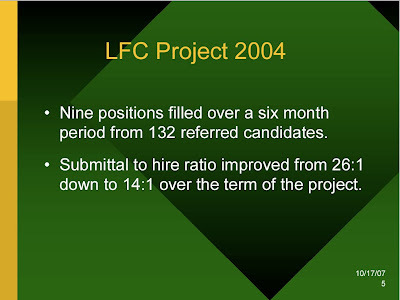 The project was so successful that it was later expanded and later updated. 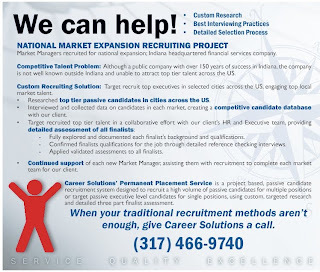 After four or five years, what had started as a 1,200 candidate interview record database had become a very extensive and detailed database of over 3,000 candidate interviews in metropolitan cities in Indiana, Ohio, Kentucky, Illinois, and Michigan. 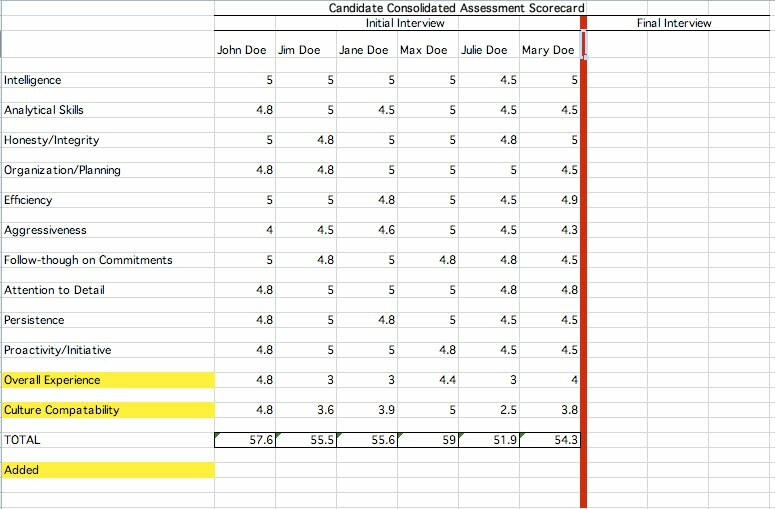 Using a standardized process for passive candidate research development, we identified all of our client's competitors staff personnel by discipline (tax, audit, or information systems) and by title (associate, senior, supervisor, manager, senior manager, director, partner). 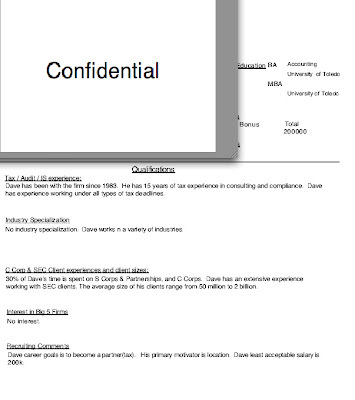 We developed a custom database for our client's project and created a layout to present the technical interview data we gathered. 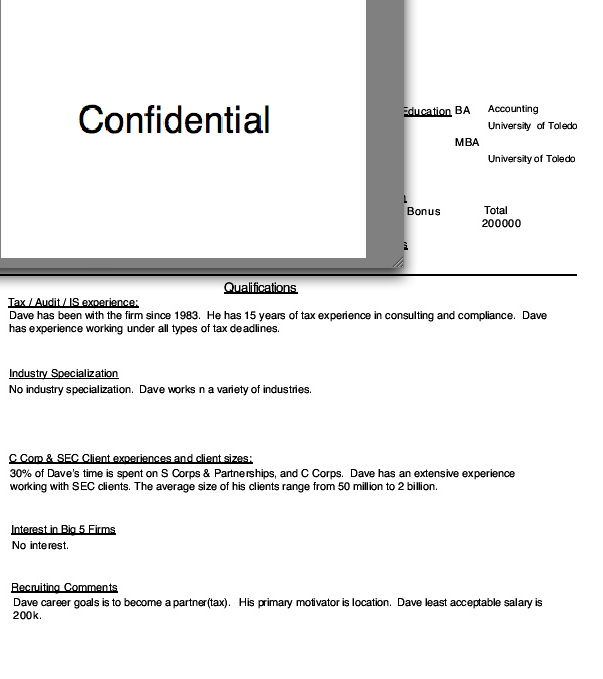 The database was searchable by fields or keywords and sortable in several options of report layouts. We also provided our client with the full database in a published three ring binder. 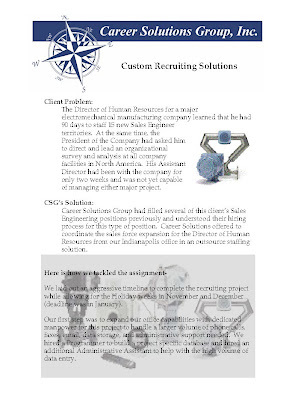 The published three ring binders became recruiting workbooks for our client's corporate recruiting team. 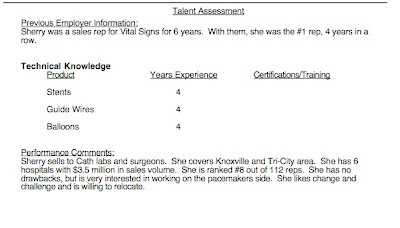 Corporate recruiters could easily browse city by city through competitors' staff to target select potential candidates and to avoid candidates that could be too difficult to recruit. 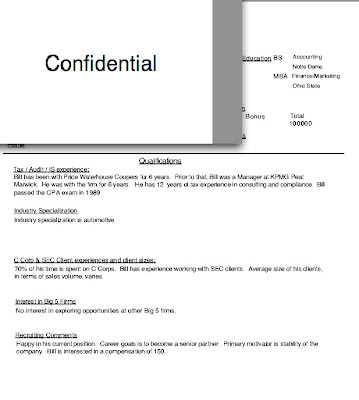 In addition to gathering standard career history, education and compensation information, our staff took candidates through a detailed interview process with scripted options for tax, audit, and information systems options. We gathered industry specialization information, business entity experience (SEC public or C corp, S corp, or LLCs and partnerships). 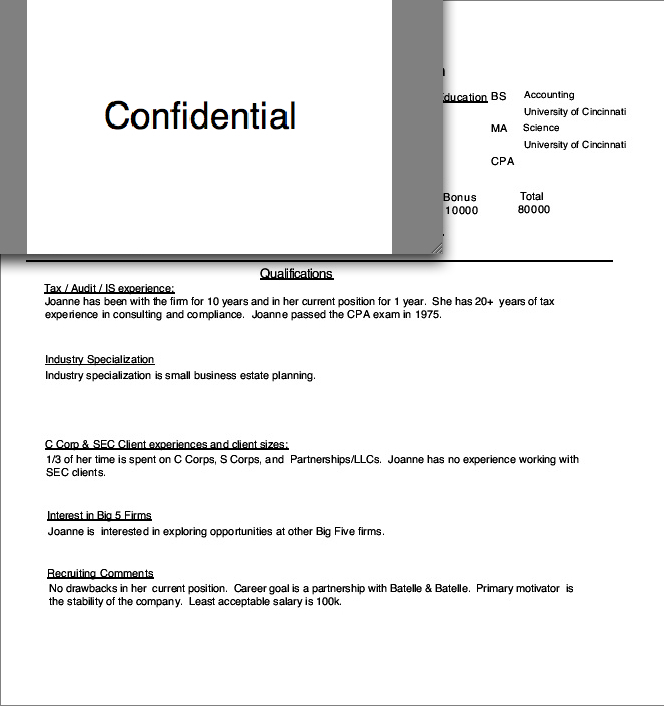 Our question regarding "interest in a Big 5 firm" while simple, opened the door for corporate recruiters to follow up quickly with those expressing interest. Our staff gathered other key personal comments and information related to motivation for a career change. 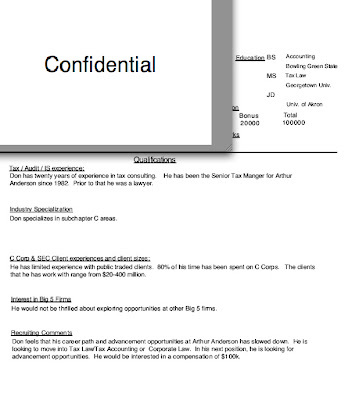 Later when our client acquired one of its major competitors, our database information was used to determine the value of potentially incoming acquired staff due to the merger. 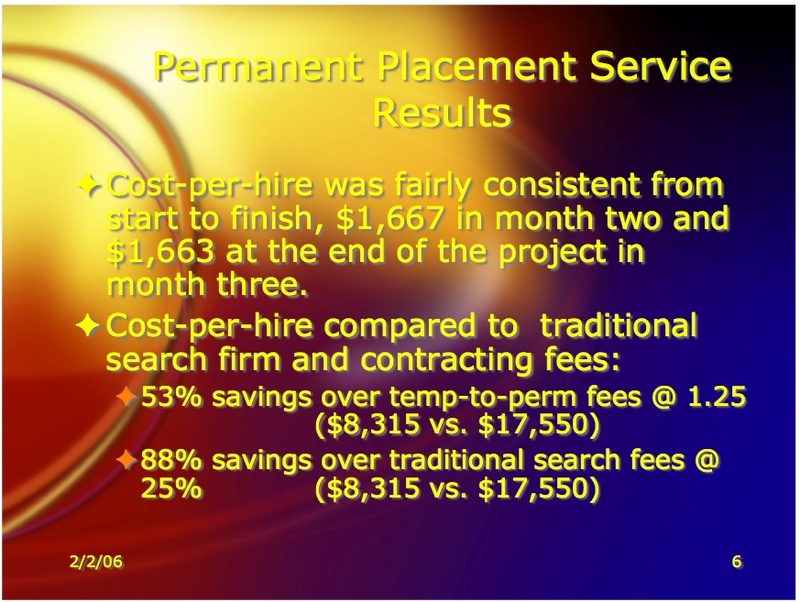 Many less valuable staff were eliminated from the merger based upon this competitive intelligence provided to our client. 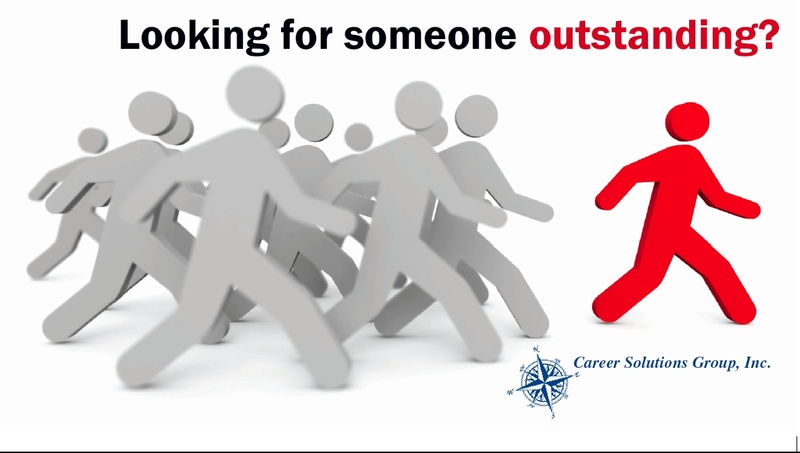 While recruiting process outsourcing and executive search are Career Solutions Group's focus, we find that sometimes the value of our service is different from our client's perspective. 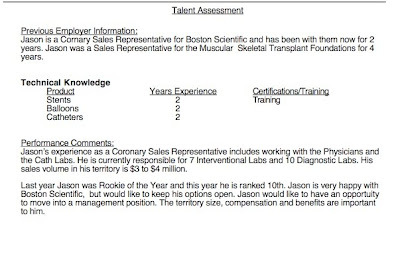 Take for example what started as a recruitment process outsourcing project for Guidant Corporation (now part of Boston Scientific) and became what we call a "Competitive Talent Assessment". 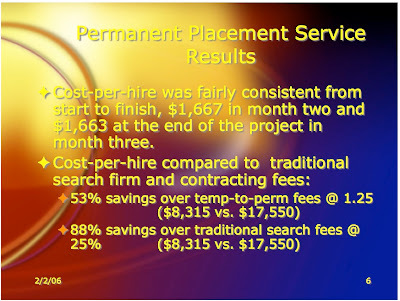 As with most of our large outsourced recruiting projects, we developed a custom database for the assignment based upon our client's specifications and requirements. 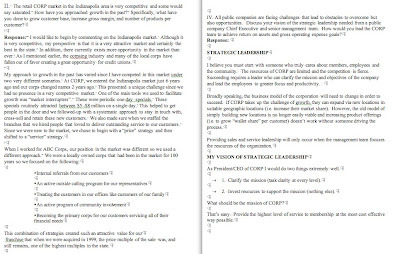 For Guidant whose corporate offices were right across Monument Circle from our office, they asked us to first develop a database of just the names and titles of the sales people at their primary direct competitors, concentrating on the eastern half of the US. 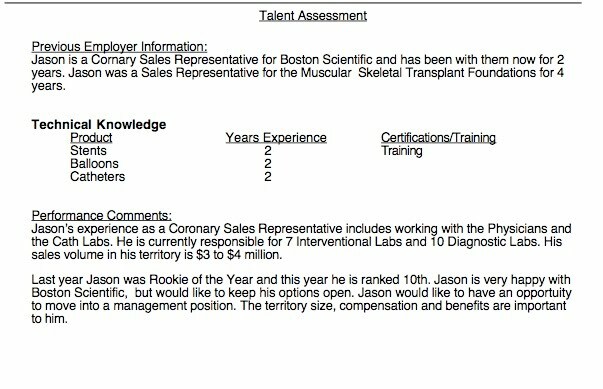 We built a database of over 500 salespeople from Boston Scientific, Medtronic, Biotronic, Cook, St Jude, J&J Cordis, and some other smaller players. 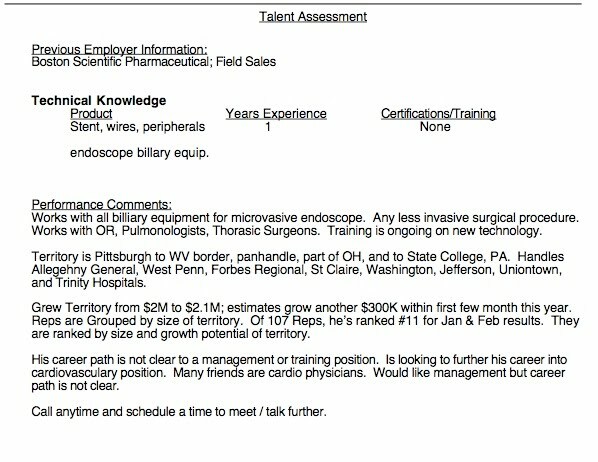 Guidant instructed our team of recruiters to work quickly (probably since they knew what would happen in a short time). When Guidant executives in Guidant Sales Corporation began reviewing the preliminary results of our database, they were surprised and excited. 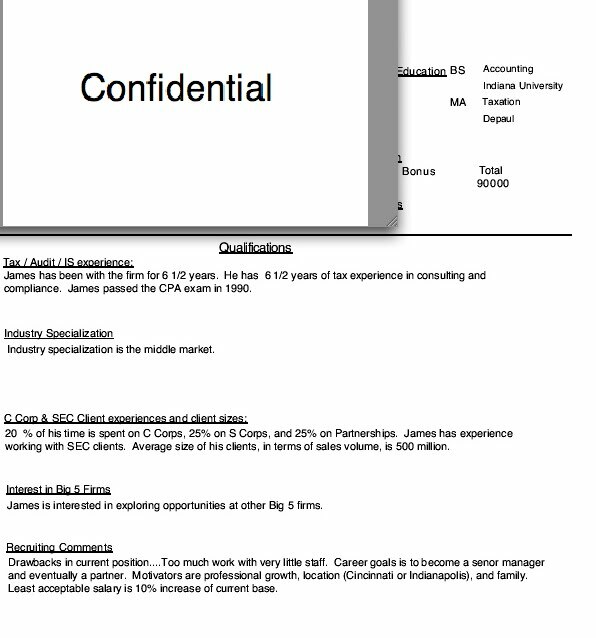 Our staff wasn't just gathering recruiting information and interest, we were gathering extremely valuable competitive information. 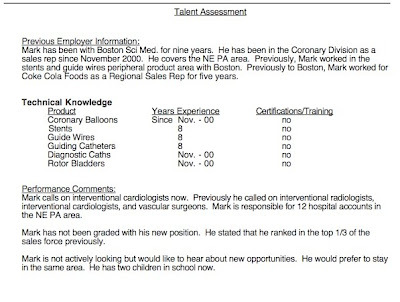 In addition to gathering standard candidate interview information about career history and education, we were interviewing Guidant's competitors about the specific products that they worked with (stents, guide wires, pacemakers, balloons, etc. 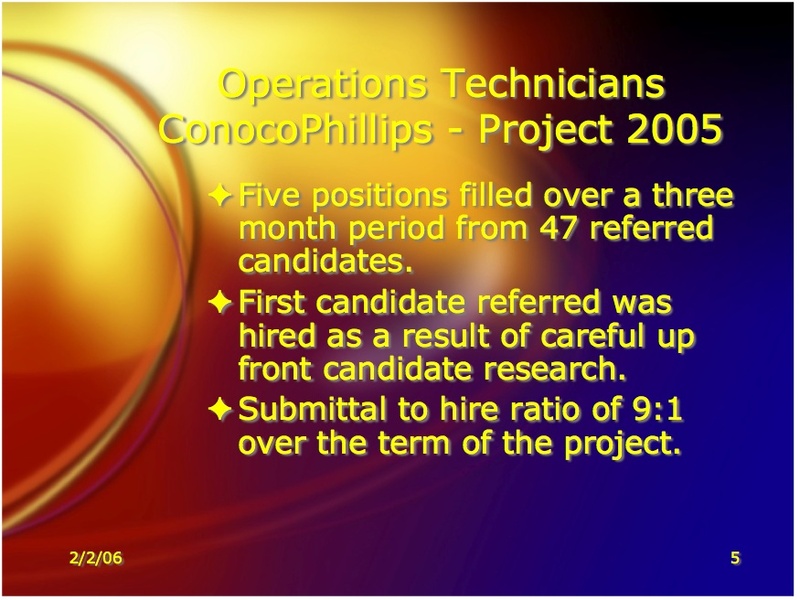 ), the number of years they had worked with each product, and whether they were certified or trained in those specific products. However in a good percentage of the 450 total interviews, we were getting very detailed specifics from competitor sales people about their total sales volume in a particular hospital, sometimes broken down by product, sales volume by hospital or clinic in each territory, what the sales person volume had been over the past three years, and where they currently ranked against their peers. Within a few weeks, our staff had interviewed hundreds of Guidant's competitors and details from the interviews populated the new competitor database. Medtronic and Boston Scientific's legal departments contacted Guidant's legal department when news started circulating of a retained recruiting firm on Monument Circle in Indianapolis interviewing hundreds of their employees. Their contention? 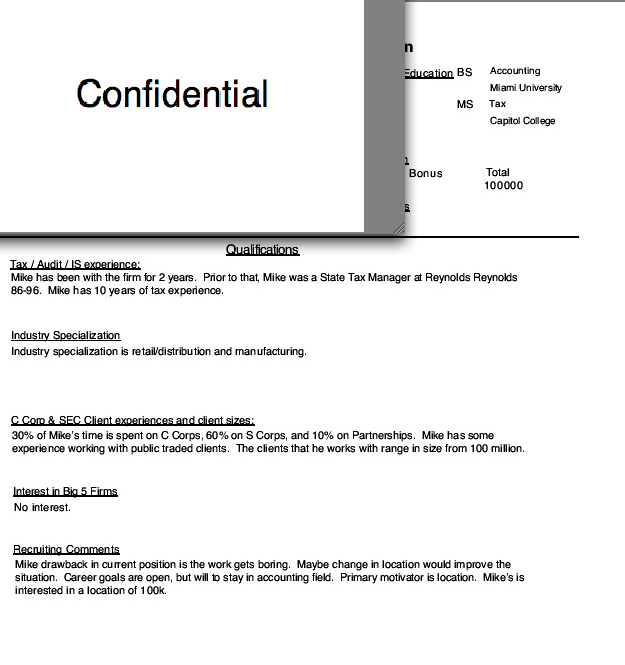 They told Guidant to tell their contracted agent, Career Solutions, that we were unlawfully using their voice mail systems. Seemed a little bizarre. But, Guidant said to wrap up the project. We delivered the finished product in several software versions and in hard copy in a three ring binder. 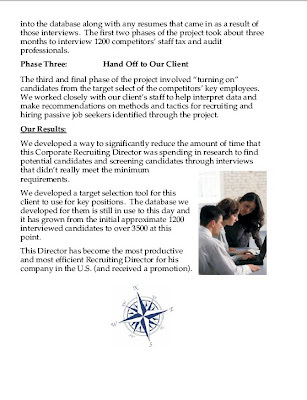 Guidant's HR team was able to quickly recruit several key competitors over to their team as a result of the project. We later learned the true value of the information that we had gathered from Guidant's competitors and the strategic value of our initiative. 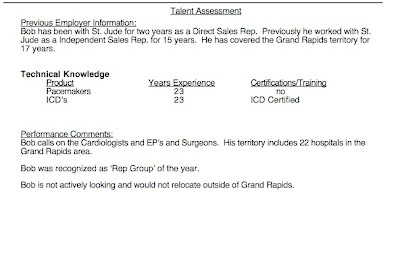 Specific competitive information was distributed internally to Guidant staff who could best utilize it. Guidant stock was trading in the $20s at the time, well below CEO Ron Dollen's comments that it should be near $100 per share. Our competitive talent assessment project was one in a series of salvos shot at higher priced competitors sending the message that Guidant intended to grow aggressively regarless of Wall Street's belief that not having a drug eluding stent would kill the company. It did not take long for the market and the competitors to react. Through a fierce bidding war, complicated by some product recalls, Guidant was sold for $76 per share months after completion of our project. Prior to Coal Gasification becoming a household term during the Presidential debates, Career Solutions Group developed a custom recruiting solution for a state-of-the-art facility processing raw coal into Syngas. 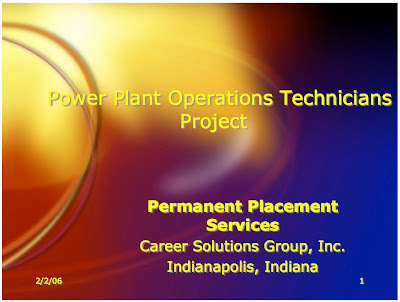 Our staff worked in a retained search agreement with joint venture partners Conoco Phillips E-Gas Gasification in Houston and Wabash Valley Power in Indianapolis to develop a talent acquisition and selection strategy which included custom research of passive and active candidates, systematized interviewing practices, and a detailed selection process. This gasification facility had been built as a Department of Energy project and had unique, high tolerance processing technology. 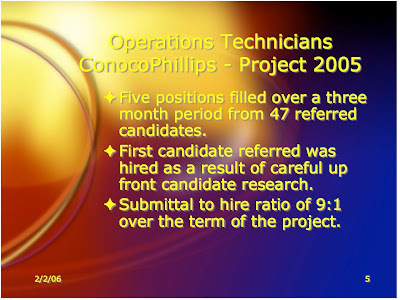 The technical management team determined that the local labor market did not have the highly trained, advanced technology technicians needed to operate the facility's equipment. 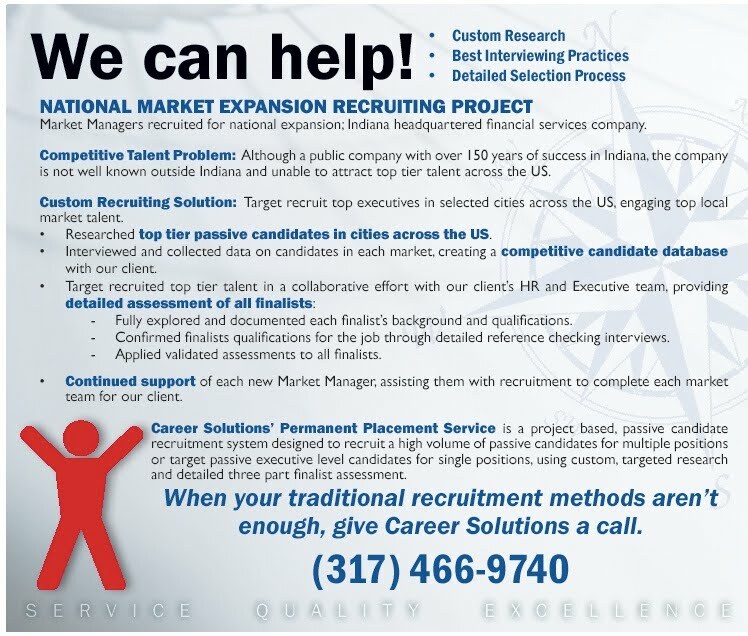 Therefore, our talent recruitment and sourcing strategy required relocation of all candidates to Indiana. 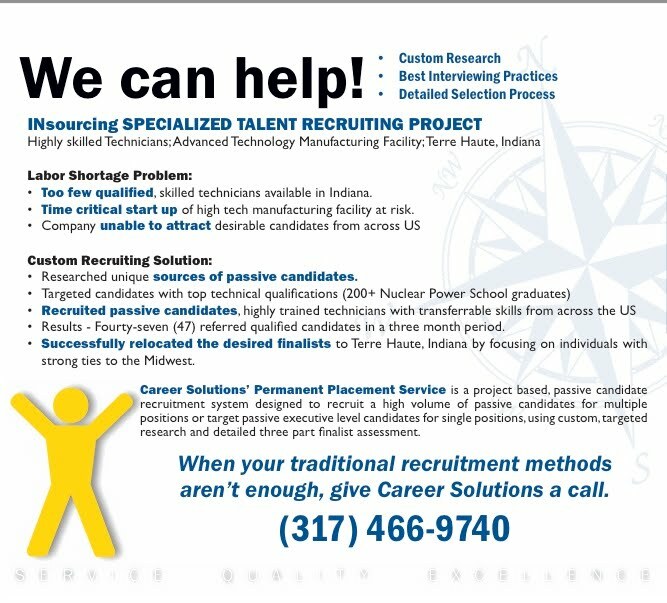 Being unable to attract desireable highly trained technicians from across the US to Indiana and faced with a time-critical start up of the plant, our custom recruiting solution used unique research methodology to identify sources of passive candidates. Our staff then target recruited over 200 highly skilled technicians who had completed the desired technical curriculum to be trained to run gasification process technology. From these 200+ potential candidates, our staff successfully recruited and referred 47 qualified candidates within a five month period. 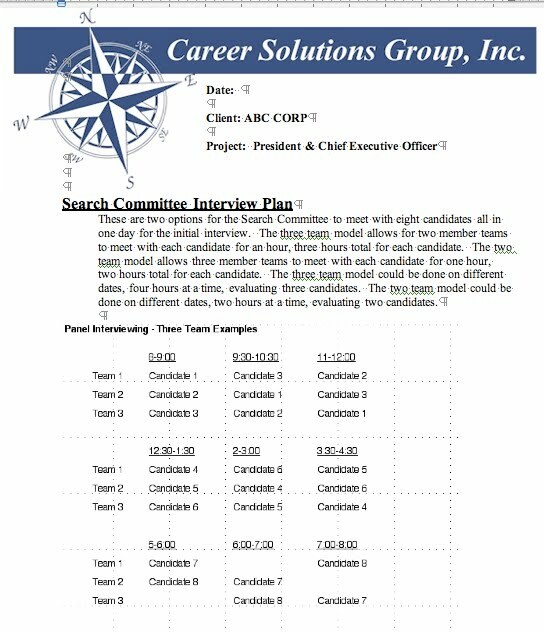 After working with the technical management interviewing team to determine the desired finalist candidates, our staff took finalists through a detailed talent selection process focused on behavioral qualifications. Eleven candidates were relocated, mostly from warmer climates like Florida, Georgia, and Southern California to Indiana. More than two years after completion of this project ten of the eleven are still at the facility. This cutting edge facility has since been converted from coal gasification to petroleum coke gasification which converts a waste product from the oil refining process into synthetic natural gas. The plant is gaining international attention with this use of a waste product to generate energy. 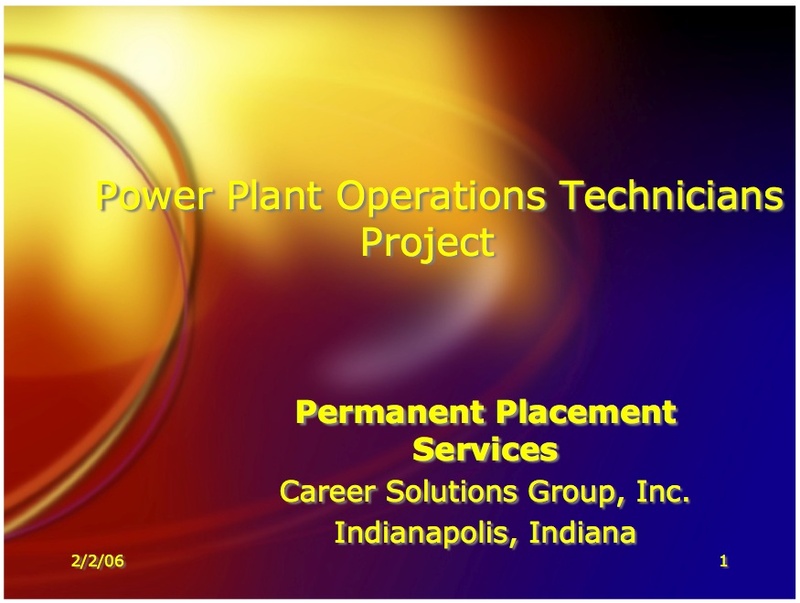 In addition to our recruitment of Operating Technicians, we successfully filled Reliability Engineering positions at the plant. 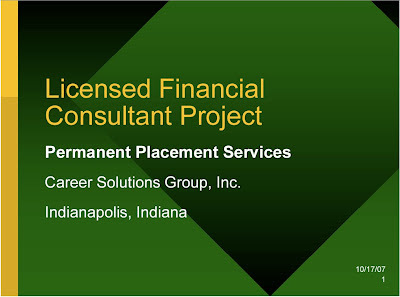 Career Solutions Group's Permanent Placement Service is a project based, passive candidate recruitment system designed to recruit a high volume of passive candidates for multiple positions or target passive executive level candidates for single positions, using custom, targeted research and detailed three part finalist talent selection. For more information on the gasification process read Wikipedia or the redefining clean energy information at theGasification Technologies Council. 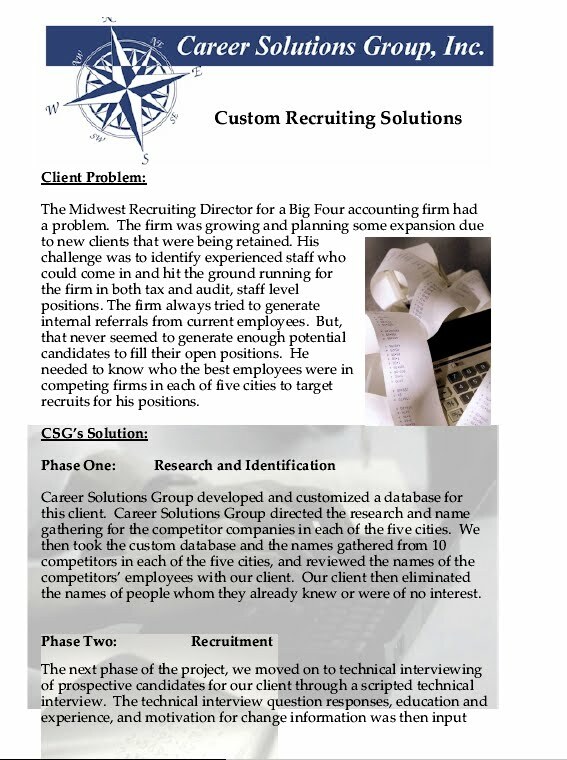 Career Solutions was retained by the CEO of a $2 billion company over several years in a strategic market expansion project. 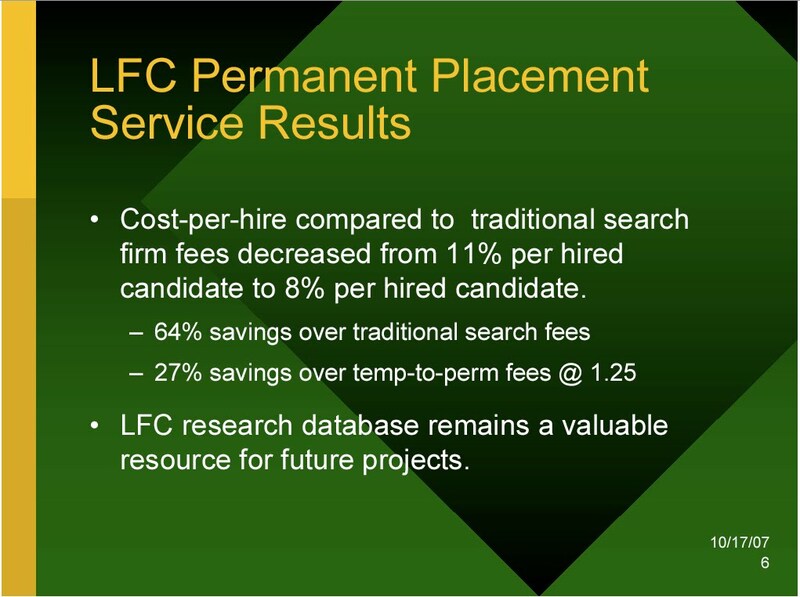 In each market, we conducted thorough research of passive and active candidates meeting the position profile. 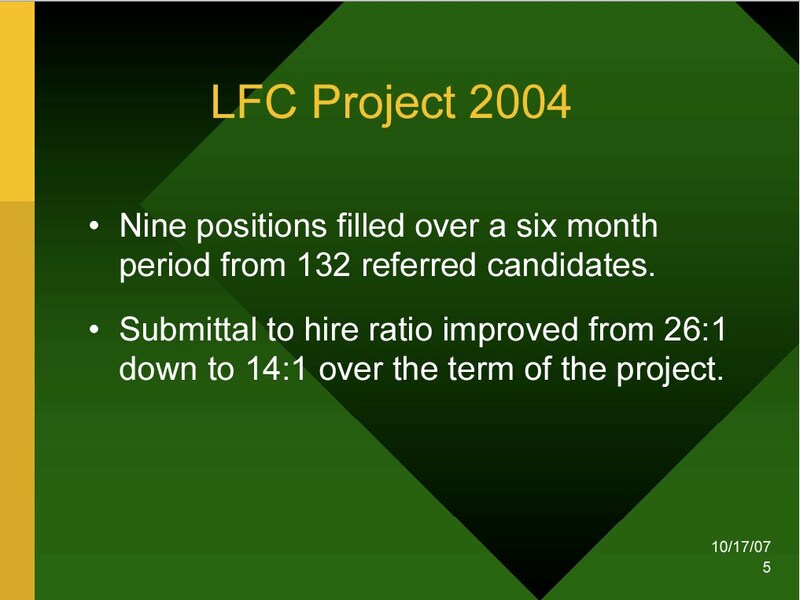 The we interviewed anywhere from 70 to 120 potential candidates per market before focusing on usually six to ten finalists. 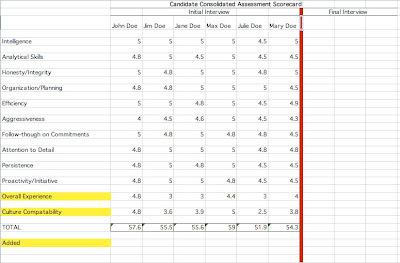 We managed the finalist candidate pool for the Market President in each location. 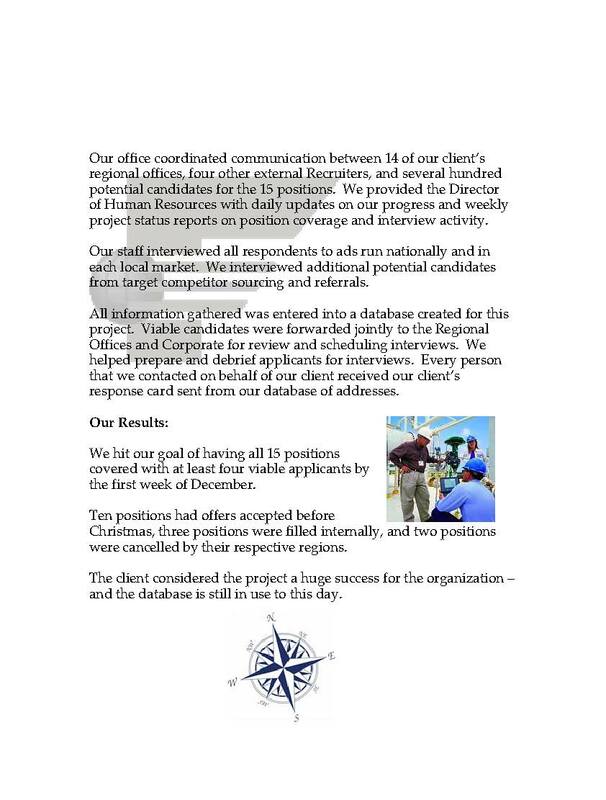 Our team took finalist candidates through coordinated detail interviews with either the Executive VP or CEO of the company, coordinated assessments, reference checking, and management of candidates through negotiation to start date. 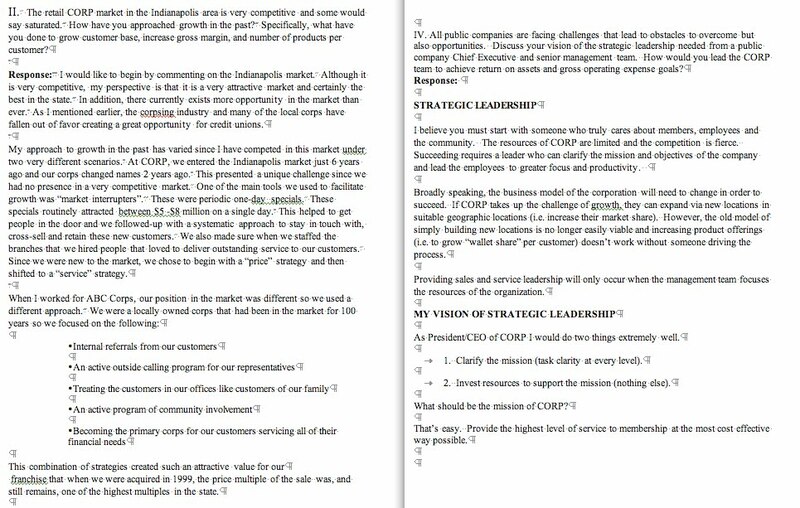 Following successful placement of a Market President, Career Solutions team then worked with the newly placed Market President to recruit and build out the new team for the market, usually using the new President's input to guide the search in the local market. In each market we went into, we had no prior knowledge of the market and knew none of the candidates. Through our detailed and thorough process we were successful in helping this CEO establish 16 new markets as the company went through a substantial 10 year growth period. 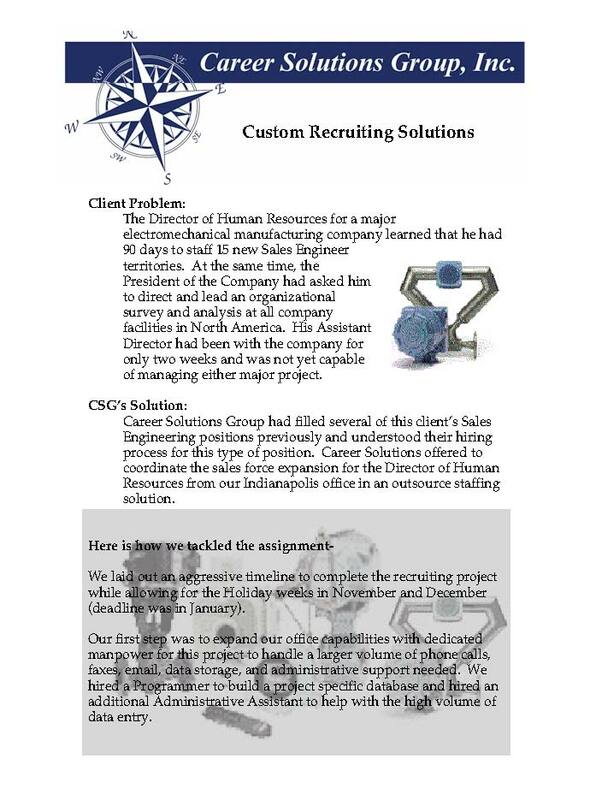 The Director of Human Resources for a major electromechanical manufacturing company ( Emerson Electric) learned that he had 90 days to staff 15 new Sales Engineer territories. At the same time, the President of the Company had asked him to direct and lead an organizational survey and analysis at all company facilities in North America. His Assistant Director had been with the company for only two weeks and was not yet capable of managing either major project. Our first step was to ramp up our research and interviewing capabilities for this project to handle a larger volume of phone calls, faxes, email, data storage, and administrative support needed. 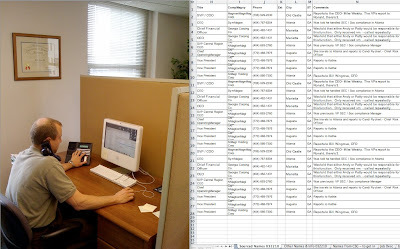 We hired a Programmer to build a project specific database and hired three Staff Recruiters, and an additional Administrative Assistant to help with the high volume of data entry. 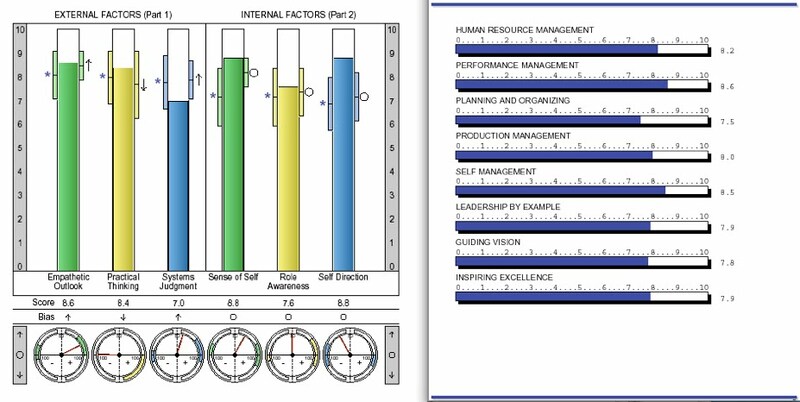 of Human Resources with daily updates on our progress and weekly project status reports on position coverage and interview activity. 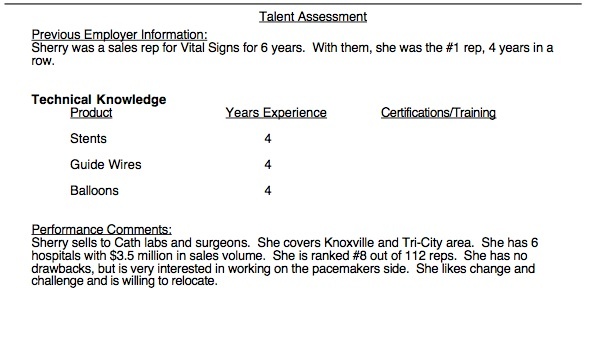 response card sent from our database of addresses. the first week of December. Ten positions had offers accepted before Christmas, three positions were filled internally, and two positions were cancelled by their respective regions. 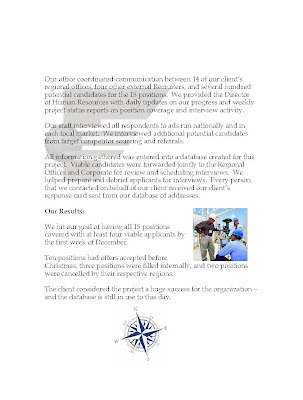 The client considered the project a huge success for the organization and the database is still in use to this day.